SF Cat Guy in the news again! Watch him with Powder, who has been returned to the shelter twice for her unruly behavior. One of the things that I find truly fascinating about cats is their keen ability to train human beings to do their bidding, no matter how inconvenient the task may be. We go to all sorts of lengths to keep our cats happy, eating, drinking and using their litter boxes, even if it means displacing ourselves in our own homes. Cats are quirky animals. They could even be described as eccentric and little bit manipulative in their methods. Sure, human beings are particular about things too, but cats seem to boggle the mind when it comes to their likes, dislikes and habits. No one ever said that living with a cat would be easy. 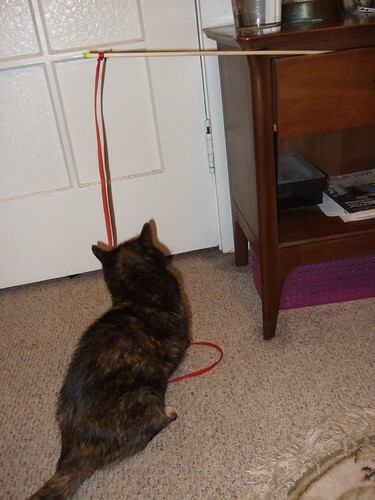 As long as you are trainable, your cat will have no worries at all. Let’s use my former best friend Matilda for example. 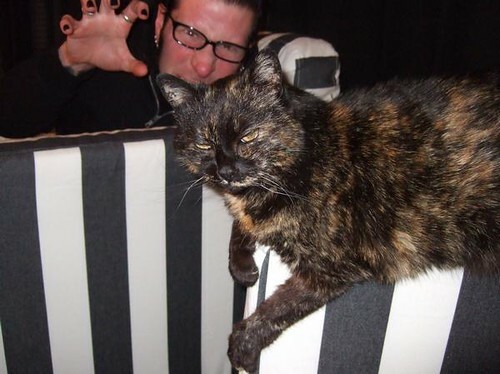 These pictures are old as she has now crossed over into immortality. When Matilda was living, her old age and experience paved the way for many alterations in my lifestyle. There were certain conditions that she just had to have in order to get through the day. Most of these conditions happened at the my own expense. 2. Matilda demanded that sleeping be accomplished under the covers and on top of my chest… the moment I lay down for bed each night. This required me to lift my comforter up so that she could spin around several times on my chest and get comfortable. 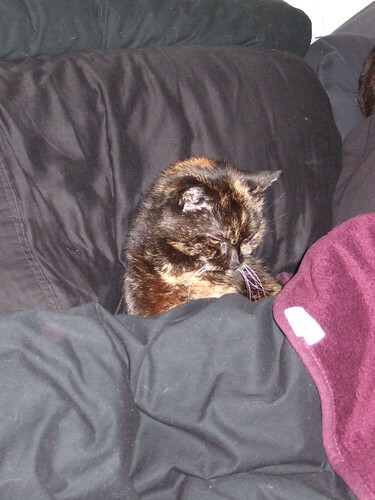 Other times, she preferred to be tucked in like a human…and I happily obliged. 3. 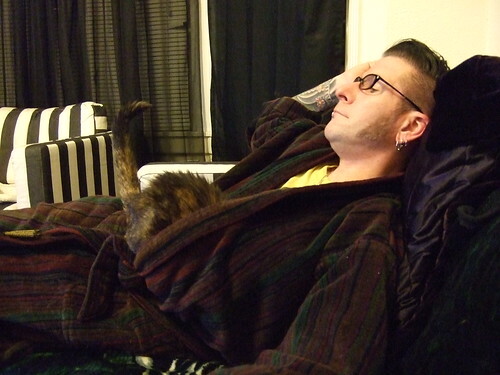 In the absence of a blanket, Matilda would attempt to crawl under my bathrobe. As you can see, this is was partly successful as there is only so much bathrobe to go around and I am wearing most of it. 4. Matilda asked that her wet food be served exactly at 7:00 Am and 9:30 PM, which was communicated by the act of trampling all over me until I finally give in to her cries for attention as she stood on my wind pipe. Her night-time demands were quite effective to say the very least. 5. 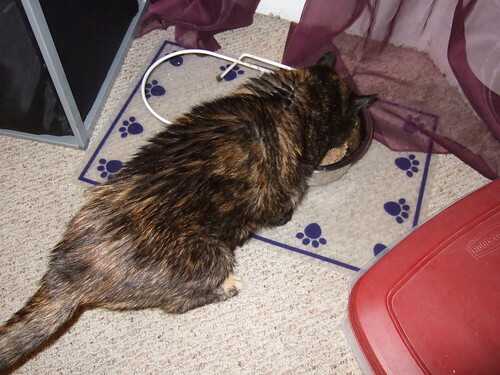 Once the food was served, Matilda would have roughly three or four bites of the food, walk away and make herself comfortable in the now empty master bed. 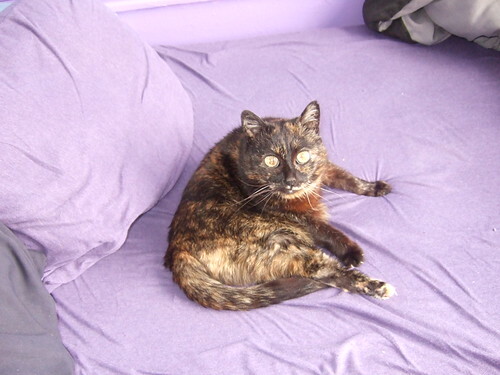 She would remain in the bed until roughly 7 pm… when I returned home. 6. For her daily work out session, Matilda required that a shoe lace attached to a stick be forever dangling from the same night stand she perched on for water. I guess she decided that having her very ownhome gym was easier than pestering me for playtime. 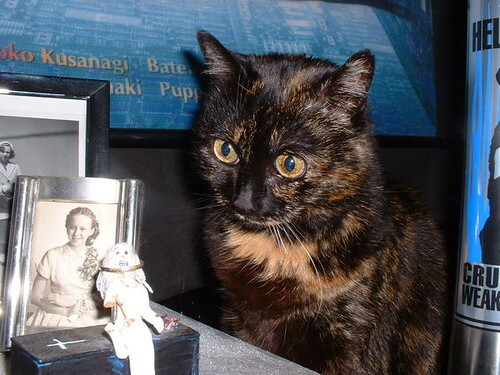 Cat guardians across the country can relate to Matilda’s story. She may be gone in body but the spirit of her quirks will forever live on. Her needs, although not that outlandish… were still her very own. 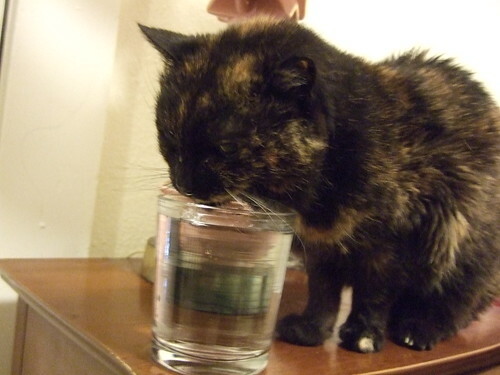 Freedom of choice is a cats prime directive. They do what they want, when they want and there’s nothing you can do about it. Resistance is Futile. 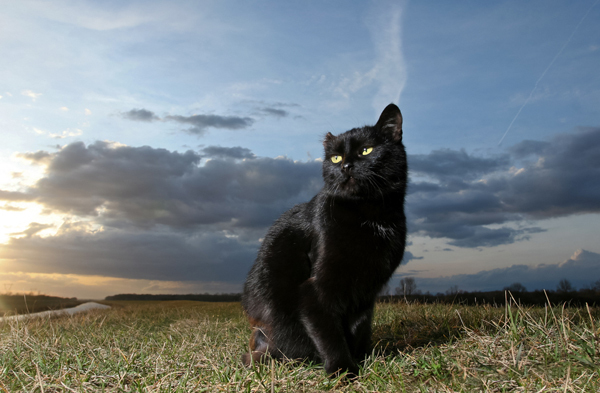 Why do black cats still cast a dark shadow on the superstitious? It’s hard to believe some of these misconceptions still exist.